If your wheels don’t seem to spin as freely as they used to, it might be time to service the bearings. Hold the skate up to your ear then spin the wheel. Do you hear a gritty sounds as if sand is grinding inside of the bearings? If so then it is definitely time to clean them out. You could leave the bearings in your wheels to clean them, but removing them will allow you to completely immerse them in a substance for maximum coverage. If you have never done this refer to this guide on removing skate bearings. 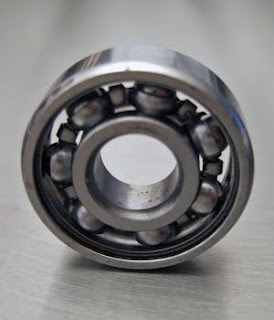 After you have removed each set of bearings from the wheel, you will need to remove the outer shield or casing from its housing, thereby exposing the individual ball bearings. There are two main types of bearings: sealed and shielded. The former is often popular for outdoor skaters who would rather not service their bearings as often. In fact sealed bearings aren’t really meant to be serviced. The fact that they are sealed implies nothing is really supposed to get in OR out. The seals can still be removed with a pin if you feel they need to be cleaned. Shielded bearings can be easily identified by the “C” clip, held by tension on the outer edge of the seal (see diagram). A pin will also work well to release the tension to remove the C clip, freeing the shield. Once the casing is removed, you can soak the bearings in a cleaning substance. What should you soak them in? It depends on how risky you want to get with flammable liquids and/or how environmentally friendly you want to be. Citrus cleaners like CLR or Sonic bearing cleaner use lemon or orange extracts to cut the grease. They are organic so you can wash them down the drain when your done. The downside to citrus cleaners is that they are slow to dry, and the last thing you want is water settling in between the ball bearings. Therefore, if you decide to use a citrus based cleaner, be sure to dry the bearings completely immediately after rinsing them. These include nail polish remover, rubbing alcohol, MEK, and more. These are more dangerous than citrus cleaners, but still relatively tame. You should wear gloves and work in a well ventilated area. The downside to some of these solvents is that they often contain small traces of water (less than 2%) or other additives that can be harmful to bearings. Examples of these include: gas, kerosene, and paint thinner. I would caution against them because they are highly flammable. The advantage to using a flammable material, however, is that it will dry very quickly, leaving no residue. Some recommend against these liquids on the grounds they do not adequately clean bearings, but this has not been by experience. If you decide to use a petroleum-based cleaner you will need to dispose of it properly, the same way you would your motor oil after it is changed. Did you know that WD stands for water displacer? It is sometimes advertised as a lubricant because in the process of oiling, de-greasing, and displacing water, it frees stubborn joints. It does not lubricate rolling parts the same way bearing grease does. WD-40 has a higher viscosity and isn’t intended for use with rolling parts at high temperatures. In addition, it will often leave a sticky residue which means your bearings will quickly attract dust and grime. WD-40 is not recommended for cleaning bearings. After you have thoroughly cleaned your bearings, you will need to lubricate them before putting the shield back on. Avoid thick lubricants such as black automotive axle grease if possible. These will just gum up after awhile. White lithium grease isn’t bad, but it can also be just a little too dense. Tri-Flow makes an excellent clear synthetic grease, almost like a gel. If you want something you can pack in there and forget about for awhile, this is probably your best bet. This entry was posted on on March 24, 2010 at on March 24, 2010 and is filed under equipment, roller. You can follow any responses to this entry through the RSS 2.0 feed. You can leave a response, or trackback from your own site. CLR is not a citrus cleaner, it would have to contain Limonene. The ingredients in CLR according to the MSDS are Water, Lactic Acid, Gluconic Acid, Lauramine Oxide and Propylene Glycol n-Butyl Ether.